Formed in 1982, team ’Tornadoes’ of the Indian Army Service Corps (ASC) already holds a total of 19 world and national records and has now added one more jewel to its crown. Breaking a previous record of 56 men, Tornadoes carried 58 Indian Army personnel on a single 500cc Royal Enfield motorcycle for a total distance of 1200m (0.75 miles) which happened only after three attemps and two falls later. The previous record was also set by another Indian Army army display team, the Daredevils, who set their record in 2010. This stunt originally began with 60 men on the bike, but the two falls injured one army men and one failed to hop onto the bike during the third and final attempt. Cladded in India’s Tricolour apparel, team driver Subedar Rampal Yadav took the handlebar while team leader Major Bunny Sharma was on the vanguard watch. All other members flanked around them standing on platforms designed specially for this event. The team Tornadoes comprises of 39 core members with two senior officers, two JCOs and 35 junior ranks of the Indian Army. 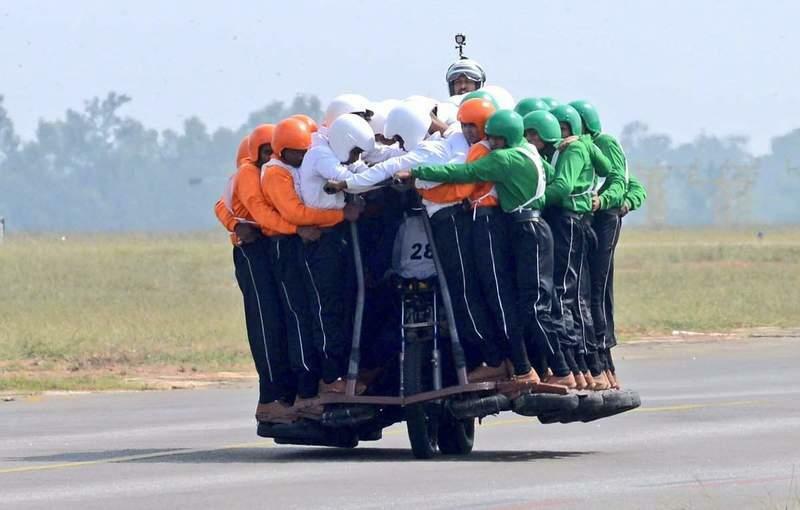 This stunt got their name etched in the Guinness Book of World Records, Limca Book of Records and Unique World Records. It is also reported that the team members just consumed one cookie and 100ml of water before the event to keep their body weight as low as possible for that day. That is some dedication. This team has also performed in over 1000 shows across the globe and has been synonymous with 20 different daring stunts and record-breaking feats.